Of these, pulse palpation is an extremely refined art and much more than the simple taking of a pulse in modern allopathic medicine. The TTM physician is aiming to understand the current ailment and also the general balance/imbalance of the three biodynamics and thereby the longer-term medical situation of the patient. The doctor needs to rely heavily on the processes of deductive logic to maximise the information gleaned through these procedures, which involve no machinery or third parties, unlike Western medicine which relies on blood-tests, x-rays, electrocardiograms and all the other resources which form part of the modern medical network. 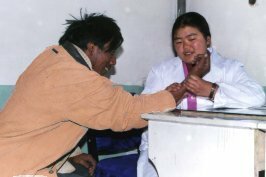 "I have my hospital just next to a Tibetan clinic in Gangtok, Sikkim. About half the local people come to me and half go to them. I am here, with my endoscopes and other equipment. They are there, taking pulses and stirring urine samples. What often strikes me is that, in the end, there is not really much difference in our success rates." Of great interest to us at Tara is to assess the effectiveness and application of TTM in the modern world. The anecdotal evidence we have from our own clinics leaves us in no doubt that it offers an excellent complement to modern allopathic medicine as well as providing a possible alternative in cases where modern allopathy has been unsuccessful. There is a need for finance so that proper scientific research can be carried out into themany areas where TTM seems, to all appearances, to be extremely helpful. GENERAL EXAMINATION The doctor studies the general complexion and demeanour, examines the tongue and sclera of the eyes, feels the temperature of the forehead and sometimes palpates the ear lobes and glands of the neck region. This will be followed by a specific examination of a wounded or painful part of the body. QUESTIONING This vital component of the diagnostic process can take two forms: direct and indirect. Overtly, the patient will be asked about symptoms, their duration, general diet and lifestyle, previous history and so on and so forth. However, if the doctor is dissatisfied with the response and feels that the patient is being untruthful, partially truthful or in some other way unable to supply the information needed, s/he alsohas many ways of using deduction, through indirect questions, designed to bring out the truth. The physician may also feel it necessary to question those close to the patient, especially in cases where the latter is too ill or confused to express his/her condition clearly. "The pulse is the messenger carrying messages from the illness to the doctor"
Pulse palpation is one of the most refined tools in Tibetan medicine and, equally, one of the hardest to master. Similar - though not identical to - pulse palpation in Traditional Chinese Medicine - pulse palpation in TTM usually requires something like the experience of some 10,000 pulses before real 'feel' and mastery is acquired. For those unfamiliar with this process and finding it hard to understand how the pulse can be such an important and complex vector of information, it may be helpful to think of the refinement of a wine-taster's art, able to pick up so much detail compared to that of a novice, or to know the difference between what the ear of a musician with perfect pitch can detect - in the way of harmonics, subtle differences of tone etc. - compared to that of the layman. The pulse is the intermediary allowing the physician to attune to (as much as is possible) and 'listen in' to the activity of the patient's body. It requires almost total stillness on the part of the doctor, changing the usual two-sided, patient-doctor dialectic into an extremely silent, attentive space (of the doctor's awareness) in which the patient's body can tell its story. This is a very physical, non-cerebral and direct contact, followed immediately by a series of intellectual deductions. The physician is in fact seeking six areas of information from each wrist palpated, as well as general information on the body's functioning as a whole. the drawn out, smooth and supple so-called "bodhisattva" pulse. 2. the 'temporal' pulse. Human biology is affected by the time of day and the season of the year. Certain effects appear in the pulse according to time of day and season of the year. A novice might confuse these with clues of organic misfunction if s/he were not aware of such influences. Urine can convey important information about the body's functioning. In TTM, this information is gathered through visual, olfactive and sometimes gustative inspection, not through chemical analysis. In line with TTM main classification of pathogenesis, observations are translated in terms of the three biodynamics. An excess of any one of these three biodynamics will give characteristic indications of colour, odour, consistency, vapour, sediment (if any), surface film and so forth. Ideally, the urine inspected is that passed at dawn, assuming that on the previous day and evening certain prescriptions have been observed. The urine is examined when still warm, while cooling and when cold. It is sometimes agitated with a stick so that the sort of bubbles it gives rise to may be observed. Obviously, the urine samples brought by patients during the day can only be inspected cold. Traditional Tibetan Medicine has always been open to improvement and criticism. As mentioned in other pages, it has incorporated the finest elements of Indian ayurveda, Chinese traditional medicine and other medicines as well. Its genius has been in knowing how to relate and combine the various elements of medicine to make a meaningful and practical whole. During the last half century TTM has been more and more exposed to modern allopathic medicine. It is an interesting meeting which may take another 50 years to produce some very useful results. Some elements of modern medicine, such as x-rays, electrocardiograms, some blood tests etc. have such evident benefit that TTM doctors who have access to such faciltiies have decided to learn more about them. This is particularly true on the Tibetan plateau, where several major TTM teaching hospitals work jointly with modern allopathic ones in the same town. Some TTM doctors take extra years of training so as to be able to communicate more efficiently with their colleagues in the allopathic world and to share wisdom and resources.